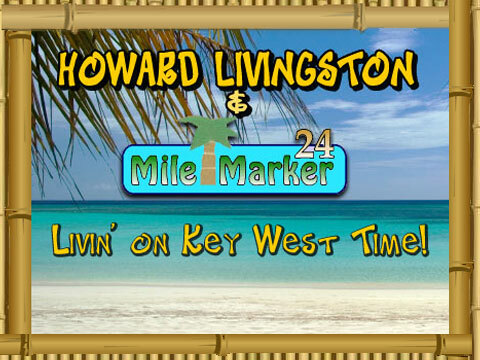 "Key West Time, starring Howard Livingston"
Key West Time "THE #1 HIT TV SERIES FROM THE FLORIDA KEYS!" In Over 33 Million Households Coast to Coast � Nationwide! Howard is a native of the mountains of eastern Kentucky. His mother spawned his love for music by introducing him to the guitar at age five. While the love of music never did leave him, his career pushed him in a different direction. While building his business, he traveled to the Florida Keys, where he developed a severe case of “Keys Fever” He never wanted to leave. The more he visited, the more music, and the keys called out to him. Finally, he surrendered. The islands called both he and his guitar. He teamed upo with this group of talented musicians and Mile Marker 24 was born and the island music goes on and on.